Intermittent claudication is a pain that can feel like a muscle cramp (especially in the calf area). It's brought on by exercise or physical activity such as walking and is caused by poor blood flow to your muscles. The pain should get better after resting for a few minutes. It usually affects one leg but it can affect both. Intermittent claudication is caused by a narrowing or blockage of your arteries due to atherosclerosis. This reduces the blood flow in your leg. It means that the extra blood needed when you exercise can't reach your muscles. When muscles get short of blood they start to seize up or cramp, causing tightness and pain. If you have intermittent claudication, the arteries supplying blood to your heart and brain are also likely to have narrowing. This means you're more likely to have a heart attack or stroke. Being diagnosed with intermittent claudication is an opportunity to change your lifestyle and use other therapies to help stop this happening. To diagnose intermittent claudication, your GP will ask you questions about your pain and about how far you can walk. They will also examine the pulses in your leg, and look at the leg's skin colour and temperature. How is intermittent claudication treated? Most cases of intermittent claudication don't get worse for many years. Treatment options include walking therapy, reducing your risk factors, medication and surgery. 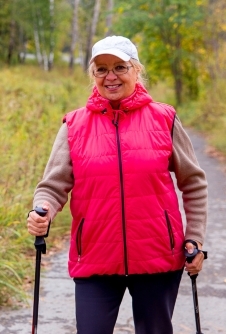 Walking therapy can be as good for intermittent claudication as surgery. As well as helping you keep active, walking helps small new blood vessels grow that improve the blood flow in your legs. You're likely to be prescribed a statin cholesterol medicine (even if you don't have high cholesterol) and an anti-clotting medicine like low-dose aspirin or clopidogrel to help prevent blood clots from forming. arterial bypass, where the surgeon redirects the blood flow around the blockage. This page has information about intermittent claudication including how it is treated.